miniOrange provides a ready to use solution for Pulse Secure Connect. This solution ensures that you are ready to roll out secure access to pulse secure connect to your employees within minutes. The Pulse Client generate safe and secure connection with your corporate Pulse Secure Connect SSL VPN gateway. It provides quick access to data and business applications from off campus. You can connect from anywhere and anytime. miniOrange integrates with Pulse Secure Connect Secure SSL VPN to add two-factor authentication to VPN login.To add two-factor authentication to your Pulse Connect Secure, your Pulse Secure Access SSL VPN should be compatible with miniOrange. Log on to your Pulse administrator interface and verify that your firmware is version 8.3 or later. Also you have to do primary authentication configuration for your SSL VPN users, e.g. LDAP authentication to Active Directory. You can enable two-factor authentication (2FA) for your Pulse Secure Connect Managed AD directory to increase security level. When you enable 2FA, your users enter their username and password (first factor) as usual, and they have to enter an authentication code (the second factor) which will share on your virtual or hardware 2FA solution. To enable 2FA you can enable RADIUS authentication in Pulse Secure Connect and configure policies in miniOrange to enable or disable 2FA for users. Guidelines to configure RADIUS authentication in Pulse Secure Connect with miniOrange. In Step 1 Select “Pulse Secure” in Application section. In Step 2 Select “DEFAULT” in Group Name and enter Policy name as “Pulse Secure” add policy then Select First factor as “PASSWORD”. Click on Test Configuration to check whether you have enter valid details. For that, it will ask for username & password. Login to Connect Secure administration console. Select Authentication > > AuthServers. Select "RADIUS Server" from list then Click on "New Server". Enter the details on New Radius Server page. Enter the details of "Backup Server". Click on Users >> User Realms >> New User Realms. Enter the details in New Authentication Realm form. Enter the path of your authentication portal. Check the "User picks” from “list of authentication realms”. Select Realm of your users. 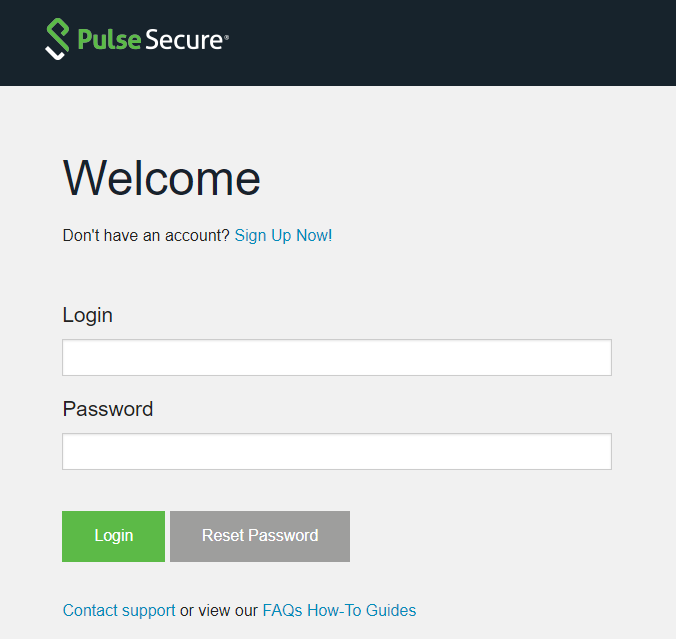 Login to Pulse Secure Client . Check your downloads folder and double-click on Pulse Secure Installer file. Follow the steps in the installer. Enter your computer's Administrator name and password, while installation. For Windows 7: Click on Start >> All Programs > >Juniper Networks > >Pulse Secure. For Windows 8: Click on Start screen >> Pulse Secure. Enter Username and password and click on login. To disconnection session Click on Disconnect.